In Sherman Oaks an elegant new spot, Sushi Note, offers a collaboration of high-end sushi and fine wine. Chef Kiminobu Saito (formerly of 4 on 6 sushi bar) helms a seven-seat omakase sushi bar; there are also intimate tables and booths. Owners Dave Gibbs and Silvia Gallo of the nearby Augustine wine bar have created a lengthy, sophisticated wine, beer and saké list to accompany the sushi. Sushi Note, 13447 Ventura Blvd., Sherman Oaks, CA 91423, 818-802-3443. 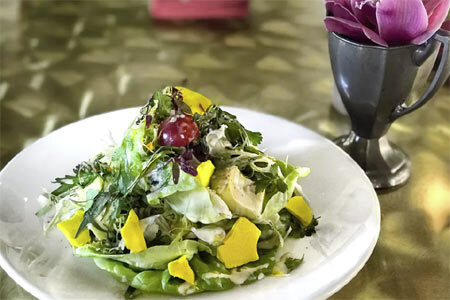 Larchmont Bungalow Café (formerly located in Larchmont) has opened in Echo Park with new owners, offering lots of exposed brick and wooden beams, a leafy patio, and a menu of salads, sandwiches, bowls, gourmet burgers and signature egg dishes. Look for morning items including latkes and lox, red and blue velvet pancakes, a vegan breakfast burrito, and a seafood omelet with lobster, shrimp and fresh blue crab. Breakfast, Lunch & Dinner daily. Larchmont Bungalow Café, 2110 W. Sunset Blvd., Los Angeles, CA 90026, 213-908-5301. Chef Teresa Montaño (Ración) has opened her progressive Spanish restaurant, Otoño, in Highland Park. Look for a variety of paellas, creative tapas, Spanish seafood classics, seasonal vegan dishes, and a Spanish specialty of squid in its own ink. To drink find a good selection of Spanish beers, wines, vermouths and sherries, as well as Spanish gin and tonics. Otoño, 5715 N. Figueroa St., Los Angeles, CA 90042, 323-474-6624. El Tejano has opened a second location in Woodland Hills, serving classics such as grilled street corn, Frito pie, a wide variety of tacos, burritos and enchiladas, and Southwest quinoa bowls. Weekend breakfast includes Tejano chilaquiles and a Texas breakfast burrito with brisket. All day, every day there’s a happy hour with a second drink “Texas-sized” for $2. Look for a large outdoor patio with games like corn hole, plenty of draft beer, frozen margaritas and a mezcal list. El Tejano, 21028 Ventura Blvd., Woodland Hills, CA 91364, 818-302-7206. Patina Restaurant Group’s latest fast-casual spot, Cocina Roja, is a nice new addition to the outdoor dining options at the Music Center. Inspired by the flavors of Mexico City, this traditional Mexican al fresco taqueria offers authentic fare featuring guacamole en molcajete, quinoa salad, shrimp cocktail, tacos (oxtail, chimichurri shrimp, chicken, steak and mesquite smoked mushroom), stuffed poblano peppers, grilled chicken, salmon or skirt steak. Cocina Roja, Music Center, 135 N. Grand Ave., Los Angeles, CA 90012, no phone. A rarified Japanese restaurant from NYC restaurateur Reika Alexander (EN Japanese Brasserie) has opened at Château Marmont in a secluded bungalow located on the property. Chateau Hanare (“cottage set apart”) is accessed from a separate entrance on Selma. Chef Abe Hiroki's kaiseki and à la carte menus include seasonal sashimi, uni toast with cherry blossom smoked uni, grilled lobster with yuzu miso sauce, Wagyu beef, foie gras hand rolls, and uni ice cream. Look for high-end cocktails and select saké and wine lists. Dinner nightly. Chateau Hanare, Château Marmont, 8097 Selma Ave., Los Angeles, CA 90046, 323-963-5269. Chef Matt Molina has partnered with the folks at Silverlake Wine to open a stylish new neighborhood spot in Highland Park called Hippo. The menu features crispy squash blossoms with ricotta and warm cranberry, hamachi crudo with kumquat relish and chervil, guinea hen ravioli, and barbequed pork country ribs. There’s a delightful list of wines by the glass, and an equally compelling cocktail collection with specialties like “Paris is Burning” mixed with bourbon, Italicus, lemon, blackberry, aquafaba and saffron. Hippo, 5916 1⁄2 Figueroa St., Los Angeles, CA 90042, 323-545-3536. 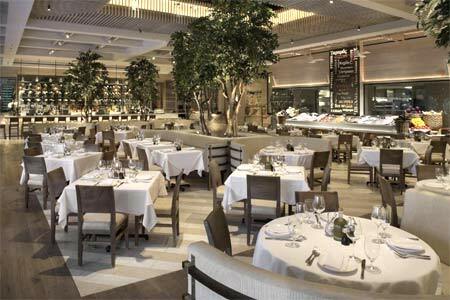 New York City’s famous Greek restaurant Avra Madison Estiatorio has opened a west coast outpost named AVRA Beverly Hills. Designed to evoke an open-air villa in Greece, the 11,000-square-foot restaurant features plenty of stone, glass and lemon trees. Expect some traditional Greek fare with a strong emphasis on fresh seafood. Dishes include Chilean sea bass soup, ouzo mussels, sashimi, and fresh caught whole fish by the pound – including Mediterranean white snapper, loup de mer, royal dorado, sinagrida and scorpion fish. There’s also a $115 porterhouse steak, grilled lamb chops, many Greek sides, and a good selection of Mediterranean wines. Lunch & Dinner daily. AVRA Beverly Hills, 233 N. Beverly Dr., Beverly Hills, CA 90210, 310-734-0841. In Venice, Rose Avenue is now home to Makani, a stylish spot for tiki rum drinks and a sleek menu from executive chef Kevin Lee. Lee’s dishes explore his Korean roots with a contemporary California spin – look for cured ocean trout, mung bean jeon, skirt steak ssams with horseradish turmeric cream, braised short rib and crispy duck confit. The rum list boasts over 80 varieties from around the globe, and some go into impressive artisanal cocktails. There’s also a progressive list of natural wines and grower Champagnes. Makani, 512 Rose Ave., Venice, CA 90291, 424-645-5410. Hasiba is a new vegetarian kosher “hummusiya” on Pico with an Israeli/Moroccan angle and a focus on a variety of fresh hummus and house-made pita (from Lodge Bread partners). Look for wild mushroom hummus with chermoula, hearty pita sandwiches with fried eggplant or roasted tomatoes and peppers, shakshouka two ways, and salads and sweets. To drink find traditional Turkish coffee, mint tea and seasonal granitas. Breakfast & Lunch Sun.-Fri., Dinner Sun.-Thurs.. Hasiba, 8532 Pico Blvd., Los Angeles, CA 90035, 424-302-0225. Bar Caló is a chic new all-day neighborhood spot in Echo Park from husband and wife duo Jaime Turrey and Brooke Fruchtman (Ostrich Farm). A Mexican-inspired California menu features poblano-corn pancakes with poached egg and salsa ranchera, chilaquiles mole with fried egg, ocean trout with chipotle mayo, salt roasted spot prawns, and market oysters with a trio of mignonettes. Look for sophisticated craft cocktails from Jeremy Simpson, a broad mezcal and tequila list, and a select wine and beer list with Mexican choices. Bar Caló, 1498 W. Sunset Blvd., Los Angeles, CA 90026, 213-278-0901. While the original Beverly Boulevard location remains under remodeling construction, Madeo Beverly Hills has opened its swank new digs on North Camden Drive, and now features a sidewalk patio. Look for the same menu of traditional Italian favorites: risotto, pastas, pizzas, whole branzino, and filet mignon with green peppercorn sauce. Madeo, 362 N. Camden Dr., Beverly Hills, CA 90210, 310-859-4903. Chef Charles Olalia (ex-Patina) transforms the former Bar Angeles in Silver Lake into a casually hip and modern Filipino spot called Ma’am Sir. There’s a long, lively bar, colorful tables and chairs, bold, artsy wallpaper, and vines romantically cascading from wooden beams. Olalia’s menu includes the likes of lumpia with shrimp and uni, baked coconut mussels, pork sisig with sweetbreads and calamansi, lobster inihaw with taro leaf curry, and rib-eye salpicao with citrus brown butter and pimenton. Expect creative craft cocktails with some tropical twists, beer and wine by the glass. Ma'am Sir, 4330 W. Sunset Blvd., Los Angeles, CA 90029, 323-741-8371. Studio City's enchanting bistro Montrésor now offers lunch service Tuesday through Saturday from 11:30 a.m.-3 p.m. The menu offers appetizers of Bibb lettuce salad with avocado, French onion soup and crab cake, followed by Croque Madame, coq au vin and the house burger topped with Comté cheese. Montrésor, 11266 Ventura Blvd., Studio City, CA 91604, 818-760-7081. French chef Daniel Boulud (of Daniel in New York City, one of GAYOT's Top 40 Restaurants in the U.S.) pioneered the "Gourmet Burger Revolution." So, it’s only natural that on Bastille Day, July 14, 2018, he launched "THE UMAMI FRENCHIE" with the famous UMAMI BURGER chain. (The timing was lucky as France won the 2018 FIFA World Cup the next day!) Discover the tasty burger, presented by Boulud himself, in this video. Then, go try it for yourself at UMAMI BURGER locations throughout the Los Angeles area, as well as Orange County, San Francisco, Las Vegas, Chicago and New York. Part of UMAMI BURGER's Artist Series, "THE UMAMI FRENCHIE" ($18) will be available until September 14th. One dollar from each burger sold will benefit charitable organization Citymeals, which provides a lifeline of nourishing meals and vital companionship to New York City’s homebound elderly. Umami Burger, The Grove, 189 The Grove Dr., Ste. C-10, Los Angeles, CA 90036, 323-954-8626. As the new executive chef of the W Hollywood, Charles Lacad (formerly of The Omni San Francisco and Four Seasons Lanai at Manele Bay) reconstructs the hotel’s menu for the first time since its opening eight years ago. Dishes at the hotel restaurant Delphine focus on elevated California bistro fare with diverse flavors inspired in part from his childhood growing up in O’ahu, Hawaii. New signature items include red-wine braised short rib parpadella; ahi crudo with yuzu avocado purée, watermelon radish and black sea salt; diver scallops with truffled sweet corn nage; and seasonal risotto. Delphine, W Hollywood Hotel & Residences, 6250 Hollywood Blvd., Los Angeles, CA 90028, 323-798-1355. Chef Josiah Citrin (Mélisse) will soon reinvent the eateries at The Line hotel in Koreatown, filling the void left by Roy Choi’s departure from COMMISSARY and POT. Citrin will helm both restaurant revamps; expect elevated French California cuisine, and likely a standout wine list. The Line Los Angeles, 3515 Wilshire Blvd., Los Angeles, CA 90010, 213-381-7411. Longtime popular Mexican restaurants Malo (4326 W. Sunset Blvd., Silver Lake) and Màs Malo (Downtown) both closed at the end of July. Mas Malo, 515 W. 7th St., Los Angeles, CA 90014, no phone. In Pasadena, the French-Vietnamese restaurant Abricott has closed. A new Mendocino Farms will open later this year in the location. Abricott, 238 S. Lake Ave., Pasadena, CA 91101, no phone. 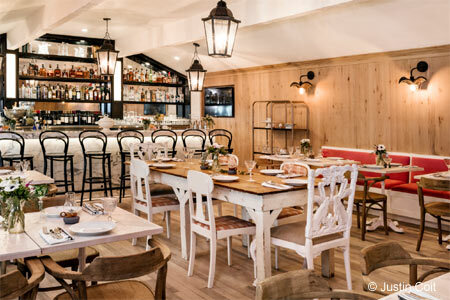 Au Fudge Los Angeles, the kid-friendly (yet chic) restaurant from Jessica Biel, is now only operating as an event space. Au Fudge Los Angeles, 9010 Melrose Ave., West Hollywood, CA 90069, no phone. Chef Neal Fraser (Redbird) has closed his casual chicken spot Fritzi Coop in DTLA. The original Fritzi Coop is still open at the Original Farmers Market on Fairfax. Fritzi Coop, 814 Traction Ave., Los Angeles, CA 90013, no phone. In Silver Lake, Bar Angeles has closed and flipped into the casually upscale Filipino restaurant Ma’am Sir. Bar Angeles, 4330 W. Sunset Blvd., Los Angeles, CA 90029, no phone.